I am a 35+ year veteran of the Brockton Public Schools. I also have a Masters Degree in Counseling. FREE REGISTRATION for Teachers who Tutor! Tutoring is the #1 Summer Job for Teachers! Author Bio: A 10-year NY State Secondary English Education Teacher, Kimberly Nellist-Ortiz is writing for her own blog, www.ateacherintherye.com, and is active in many Twitter chats (@ateachintherye). Most known for her unique theories on student-lead education, such as “I don’t give answers, and I don’t give questions, either,” Nellist-Ortiz encourages other teachers to change the way learning happens in the classroom. Follow her on social media! In my first student-teaching experience I was given a week to score 60 8th-grade essays. I procrastinated for 3 days as I struggled to figure out what to do with them. That makes me giggle because now I know all too well what goes into assessing writing, but I still procrastinate. through his 6th grade social studies book with the 11 raggedy cats in our way. This high school English teacher learned a lot about Aztecs that year, not to worry. 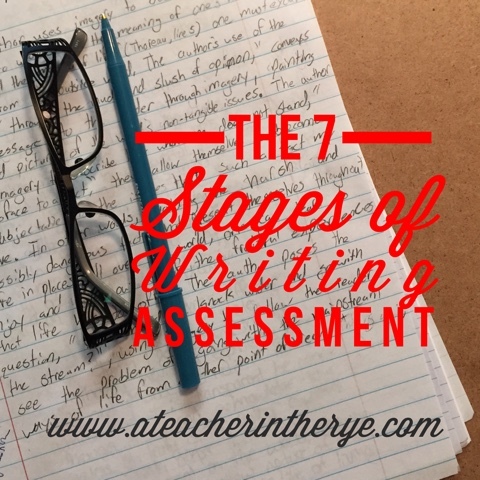 So my 10+ years of experience subbing, tutoring, and teaching grades 6-12 English (and 1 stint of Religious Ed.–again, I learned so much) has taught me that there are 7 stages to reviewing and assessing a student’s writing. In some situations you may be reading a stack of papers at your desk. In other circumstances you may be looking over a written response before the student turns it in. The assignment may be short; it may be long. In any case, these are the stages to assessing the work in its entirety. Let’s get started, shall we? Stage 1: Return to the question and guidelines. Start with re-reading the directions and knowing the whole of the assignment. If there’s a rubric, this is the time to be familiar with the criteria and levels for scoring. Get a vision of what the end product should be. If you wrote the question, you should already know what you’re looking for; but it is worth it to take that time again, and visualize the answer. Don’t misunderstand me and assume I mean there’s one way to outline the response. As a writing teacher, I have to remind myself that there are several ways a final written response could execute the answer. But having an idea about the content and potential organization ahead of time will help you look for it when assessing. Stage 2: Spend a significant amount of time reading and re-reading the focus established at the beginning. If it’s an essay, that would be the introduction and claim sentences at the end of the intro that help to narrow the focus of the essay. In the case of a short response, it would be the first few sentences. I actually have my students do this during the revision stage. What are the specific words used? Are they clear and precise? My students have learned to write these by considering the topic from the question, and adding the message they want to send about the topic. Simply highlight those focus sentences and continue reading to return to them after the first established supporting detail. a development of ideas that clarifies the concept. marking. If you’re going to mark it, you must teach it. I can’t say I spend time writing all of the instructions out on the students’ papers, but I do make note and build on grammatical lessons as we go. Otherwise, if I don’t teach it at some point, it was a moot point to mark it, as most students won’t learn to correct it on their own, anyway. the beginning to develop a feeling of completion at the end. Nothing should dangle. changes or additions made to their writing. I’d love to conclude with a stage 8 where I take a 10 minute break before assessing the next paper. In the case of a thick stack of 2-page essays, this turns assessment into a week-long process. Now you can see why I procrastinate; the task seems endless. Then there’s always this: Balancing Grading Papers and Having a Home Life. intention is on the growth and success of my students’ writing.